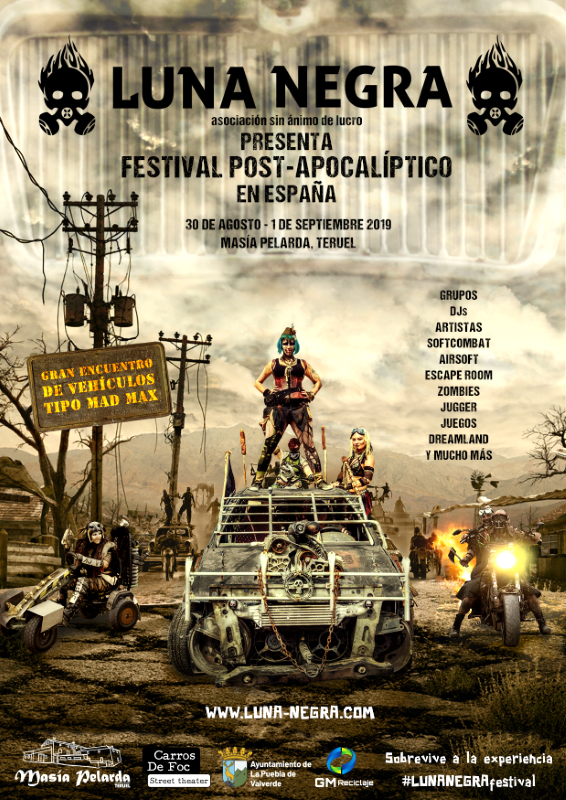 The menu above, FESTIVAL 2019, contains all the information; look and discover all activities of the unique festival! We will open on Friday the 30th of August at 5pm and close on Sunday the 1st of September at 8pm. The event in Facebook is here. The announcement video is here. The video of last festival is here. Most foreigners combine the festival with vacation; to enjoy the Spanish sun, beaches, culture and paella! We are happy to help you with anything you need; just ask! The location, called Masía Pelarda, is located 25km / 25min south-east from the city Teruel and 10km / 20min from the closest village La Puebla de Valverde. The address is H-TE-400 Carretera de Formiche, Km5, Puebla de Valverde – Teruel and THIS is the exact location. The website of Teruel´s tourism office is this. It is also available in French language. Madrid: 310km / 3h. Airport. Barcelona: 400km / 3h45″. Airport. Valencia: 140km / 1h30″. Airport. Alicante: 320km / 3h. Airport. Zaragoza: 200km / 1h50″. Airport. Only connects to England, Belgium, Italia and Romania (status Nov ´18). Castellón: 160km / 1h40″. Airport. Only connects to England, Poland, Austria. Bulgaria and Romania (status Nov ´18). THIS is a very useful map with all destinations, except for Castellón airport. The best way to travel in Spain is a car. Teruel is also limited reachable through train. There is no public transport to the festival location. As most people travel by car, it is not feasible to arrange shuttle buses but quite easy to arrange a shared car by publishing in the festival event. If you can´t find a solution, ask us! We will try to arrange a shuttle car! Lodging: there is a free camping facility in the festival enclosure. Masía Pelarda has only a few bedrooms and will therefore be fully booked soon. Teruel is very touristic and has many lodging options. This is a list to consult. La Puebla de Valverde is a very small village but has also some lodging options: see their website (only in Spanish).